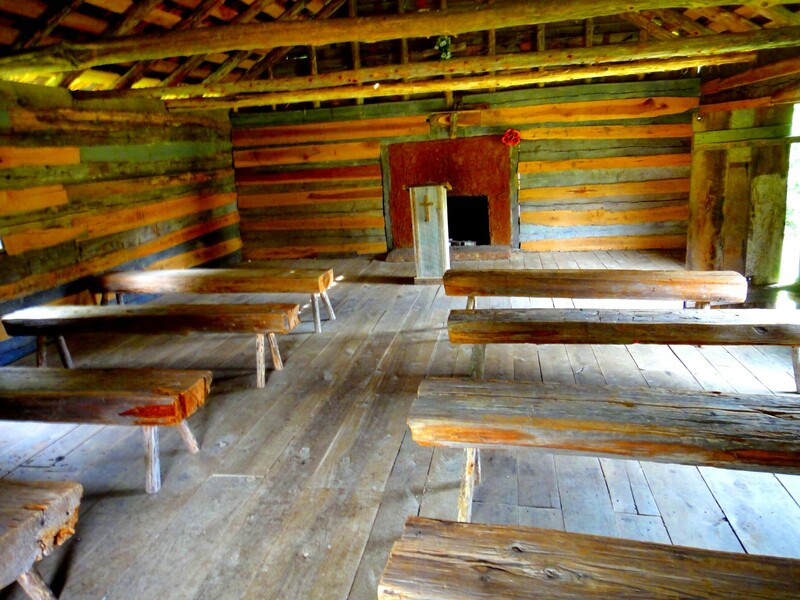 Posted by Jenny in Civil War, history, memoir, travel. 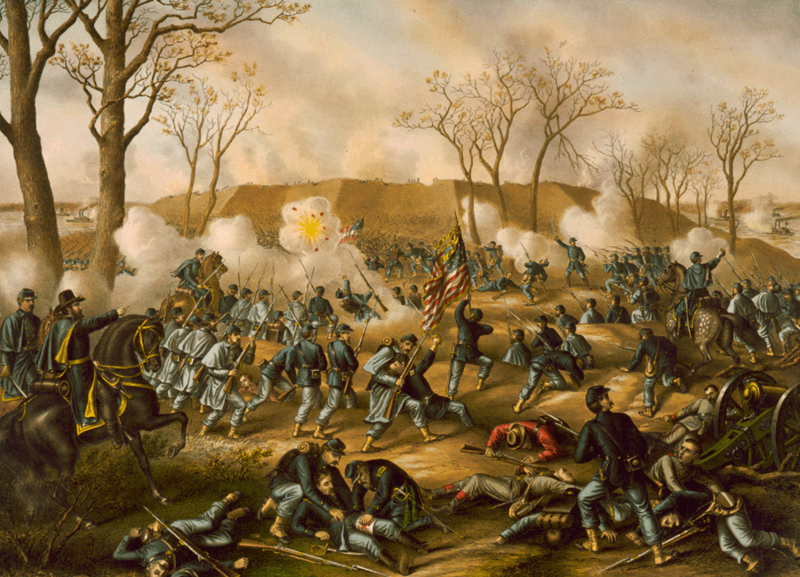 Two years ago, I wrote about the battle of Shiloh. You can read the post here. The battle has gripped my imagination for a long time. In fact, it even plays a role in my soon-to-be-published murder mystery, Murder at the Jumpoff. 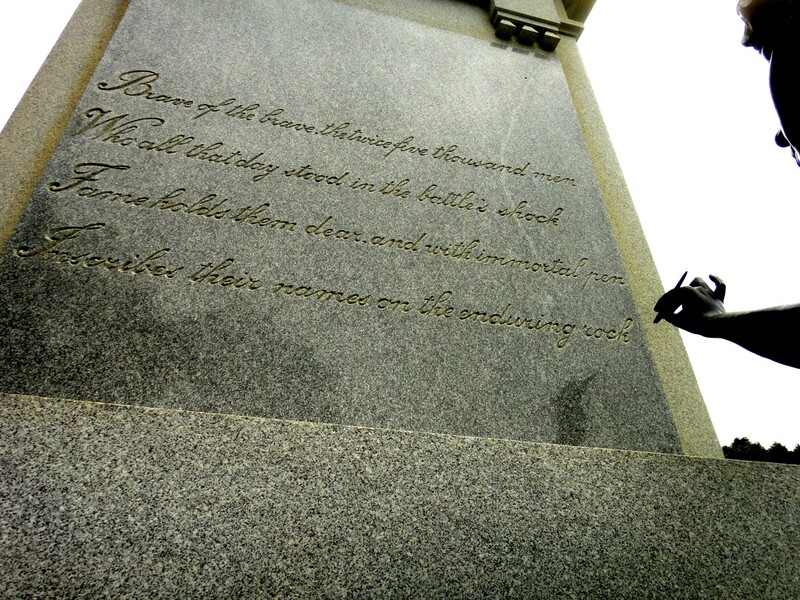 But I’d never visited the battlefield until my road trip last month. 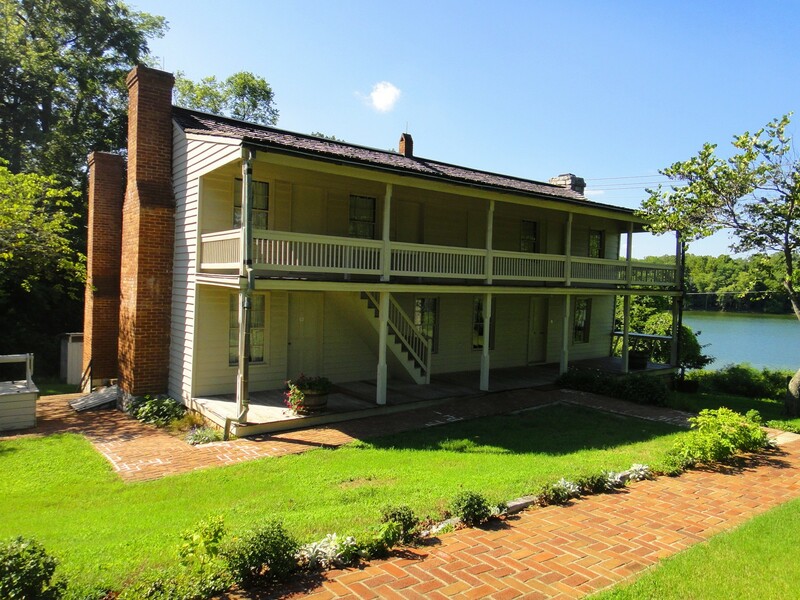 So it was with a great deal of anticipation that I left my motel in Paris, Tennessee, and drove south toward Shiloh, located close to the Mississippi border and near the town of Savannah, Tennessee. The novelty of my surroundings added to my enjoyment. I had never been in West Tennessee before except on a long-ago family trip that zipped us across the region on I-40, the goal only to get past Memphis. I did not touch an interstate on this day of travel. Instead, I cruised along on fast two-lane roads, slowing for small towns like Parsons and Milledgeville and Crump. Little brick houses fronted by red and purple crape myrtle lined these towns’ quiet streets. Comfortable puffs of smoke rose promisingly from black barrels, for I was in the heart of barbecue country. 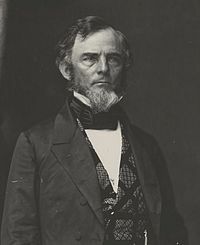 I arrived at the Shiloh visitor center just in time to hear an announcement that a ranger would soon be giving a walking tour on the subject of “Grant’s Last Line of Defense.” I met the group in the welcome shade of a towering live oak: Ranger Charles Spearman and a family from Louisiana. “So you’re from Louisiana too?” the ranger asked, assuming I had some connection with the others. “No, North Carolina.” I didn’t blame him for the assumption. 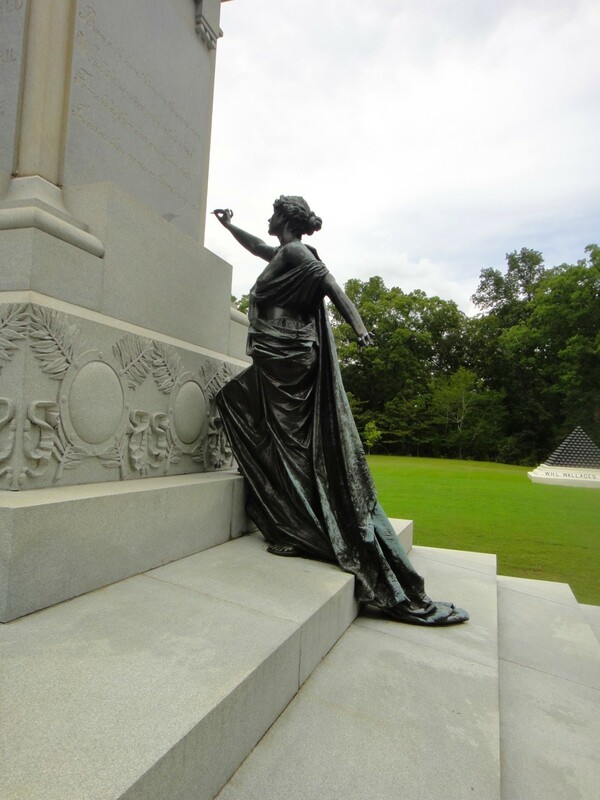 How many women are interested enough in battlefields to visit them on their own? 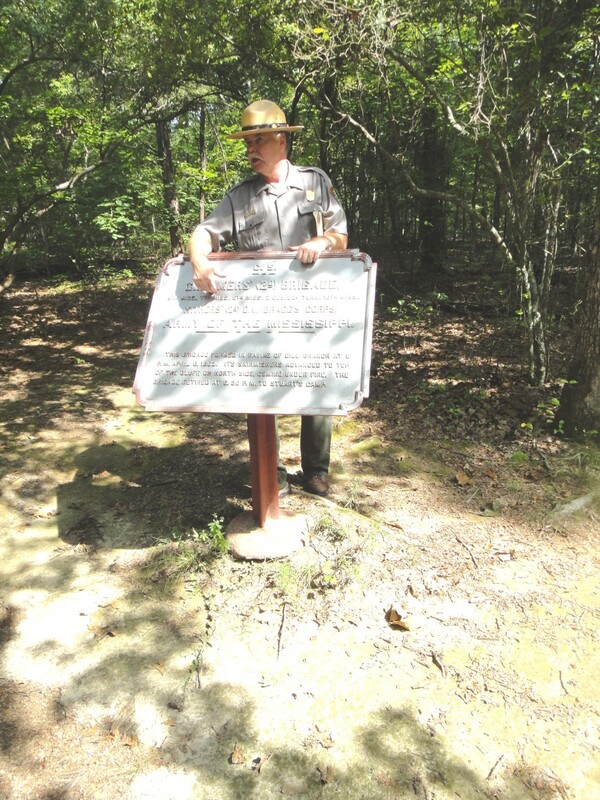 We were fortunate in having Ranger Spearman as our guide. He was knowledgeable, and passionate, about the subject. Much to the surprise of the others, I immediately started peppering him with questions. I just couldn’t help it. Here I was in the place I’d been reading about for a long time, in the presence of someone devoted to its history. 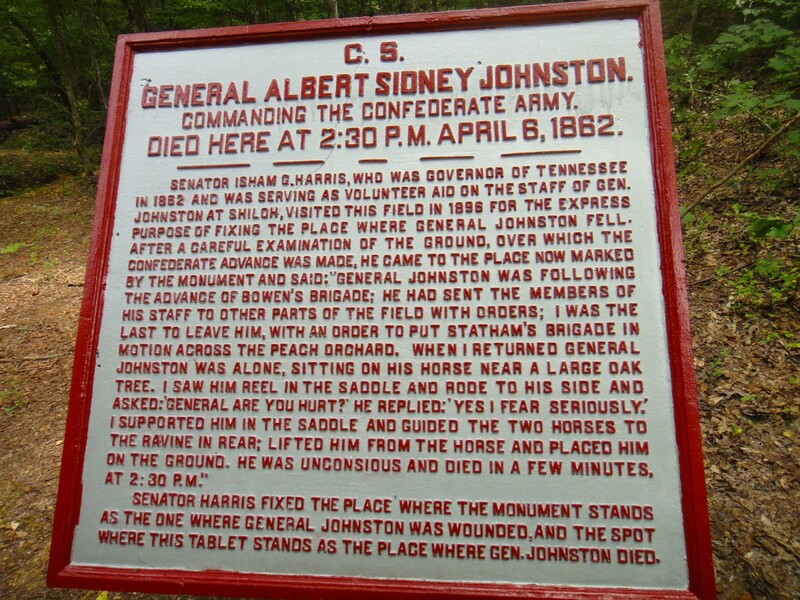 I was asking him about the relationship of Grant and Sherman, who both fought here…about the death of Albert Sidney Johnston…about the arrival of Buell’s reinforcements. 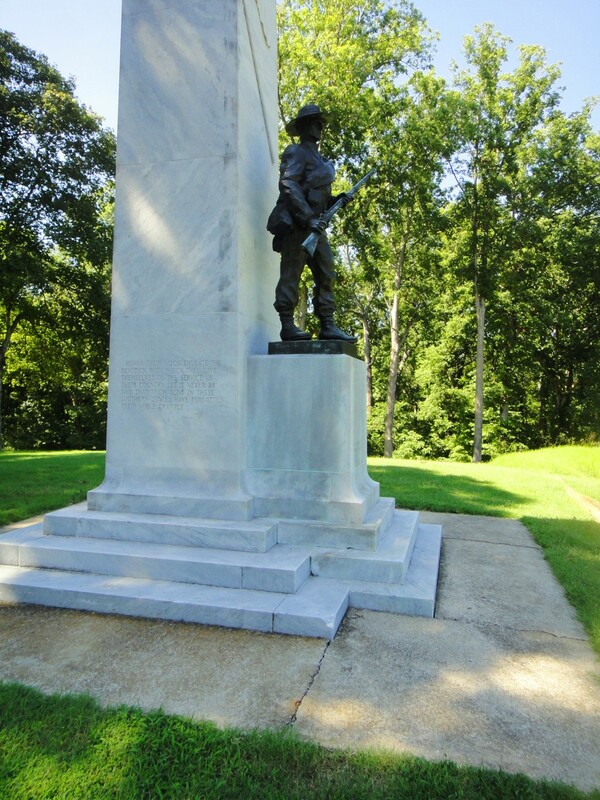 After Ranger Spearman concluded his talk and we walked back to the visitor center, I chatted with him and learned that he had previously been at the Chattanooga battlefields. 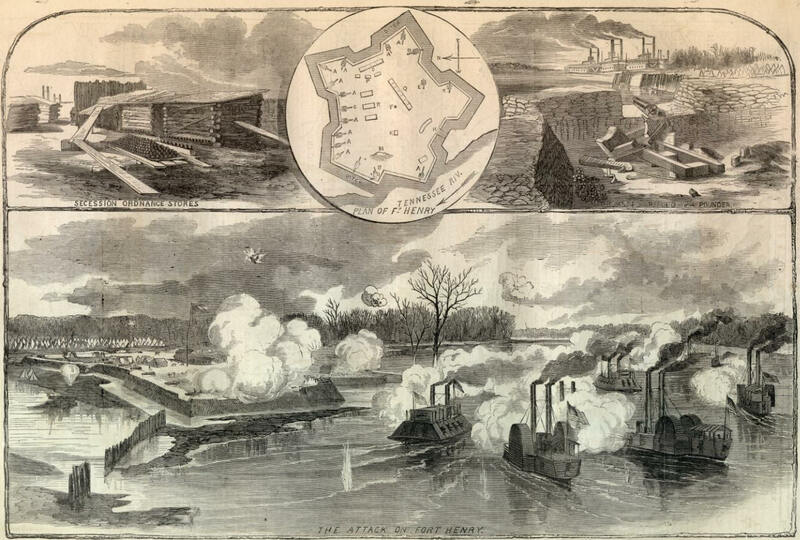 We talked about Missionary Ridge, and he mentioned that the Confederates had placed their defense line “on the geographic rather than the military high point of the ridge.” I told him that this reminded me of the British position at the battle of Spionkop in the Boer War. 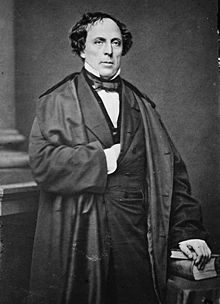 He impressed me by being familiar with the general circumstances of the war—not many Americans are. Back at the visitor center, I watched a 32-minute film about the battle. Ranger Spearman had warned us about it: “The movie’s a bit old, and they’re going to replace it.” He wasn’t kidding. The film was made in 1956, and it was narrated in a certain distinct voice—stern, a bit pompous—common to documentaries of the period. Watching events of 1862 through the filter of 1956 turned out to be comical, especially seeing the actors with 50s-style haircuts and outrageously fake beards and moustaches pasted to their faces. 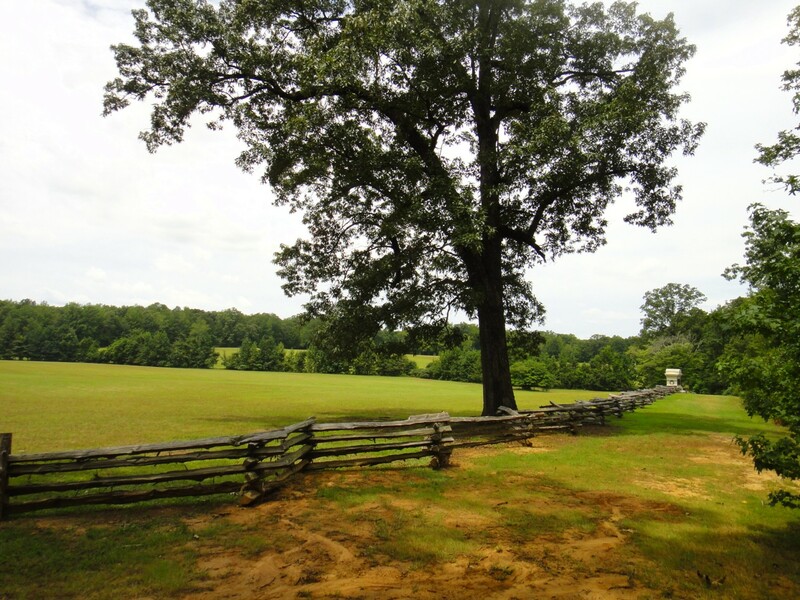 I drove around the points of the auto tour, picking and choosing according to my whim, as I had at Gettysburg. I soon passed a statue with an interesting figure on the side of it. These were the words she was writing. 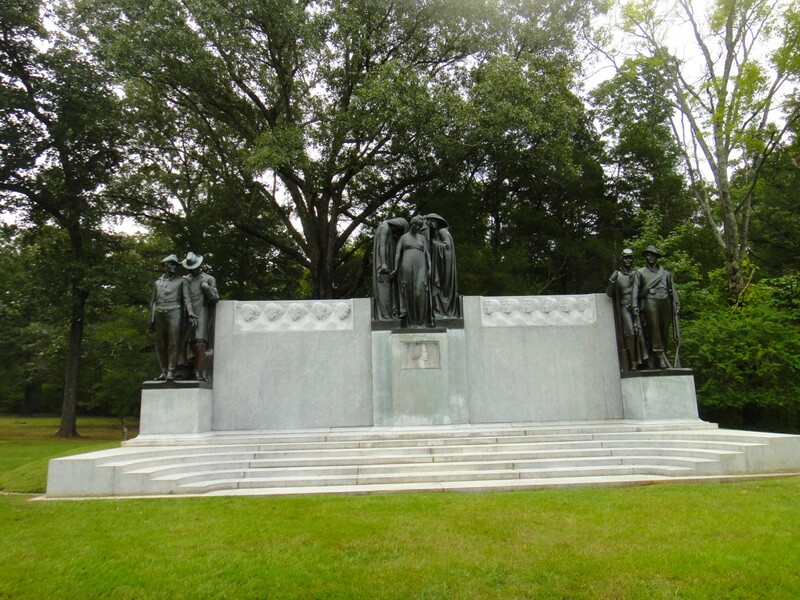 I passed the Confederate memorial. 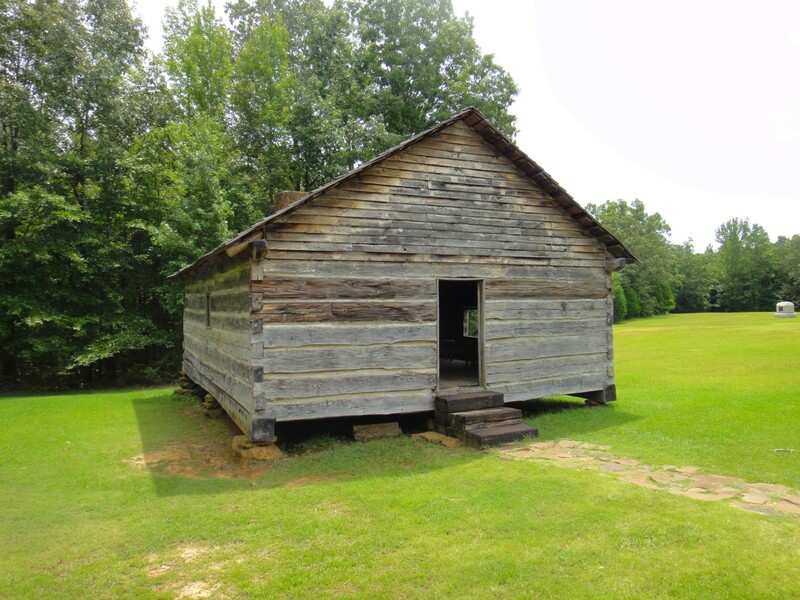 The Shiloh Meeting House was a log Methodist church, whose surroundings were the scene of desperate fighting on April 6. The church was destroyed soon after the war, and this is a replica. 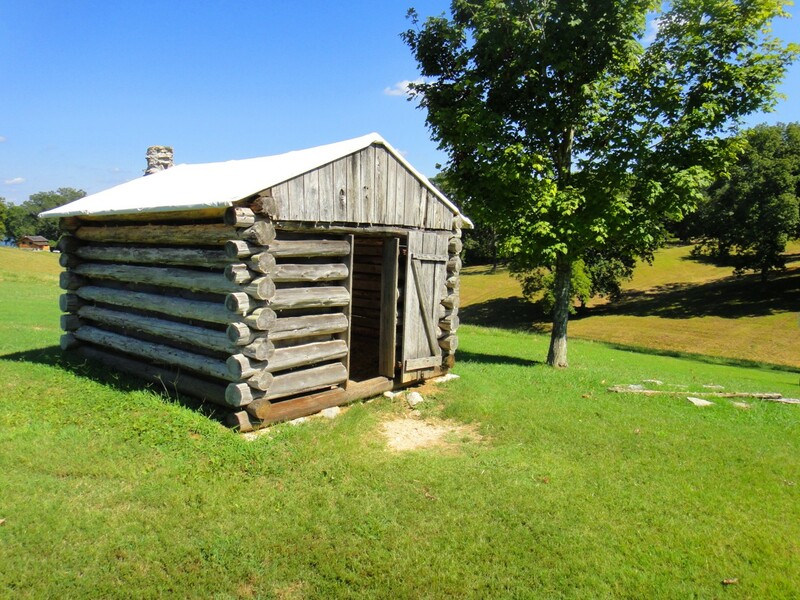 The Methodist congregation now occupies the structure shown below, located right next to the log building. 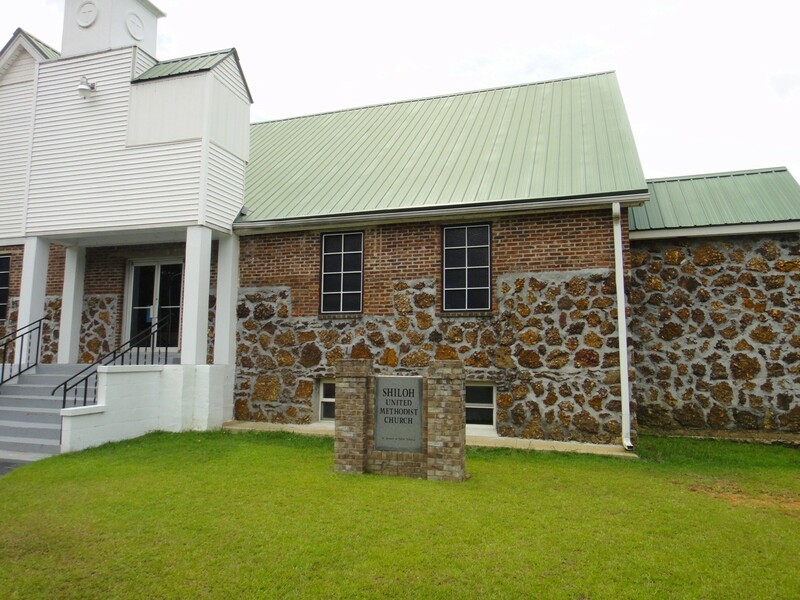 Construction of the present church began in 1929, but it stopped due to lack of funds, and the building was only completed in 1952. You can see the dividing line between the starting construction with local fieldstone and the later brick construction. 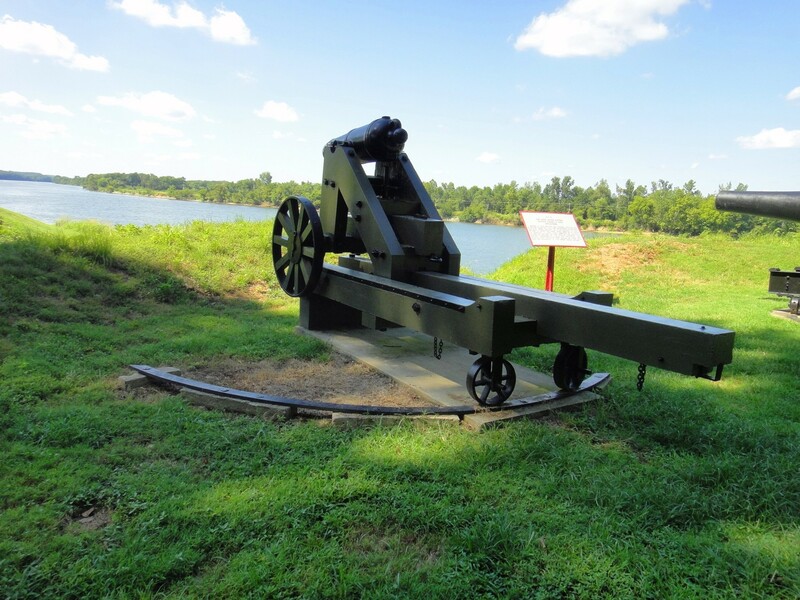 The Shiloh battlefield is very well organized in its method of presenting information. This sign near the church explained the system. 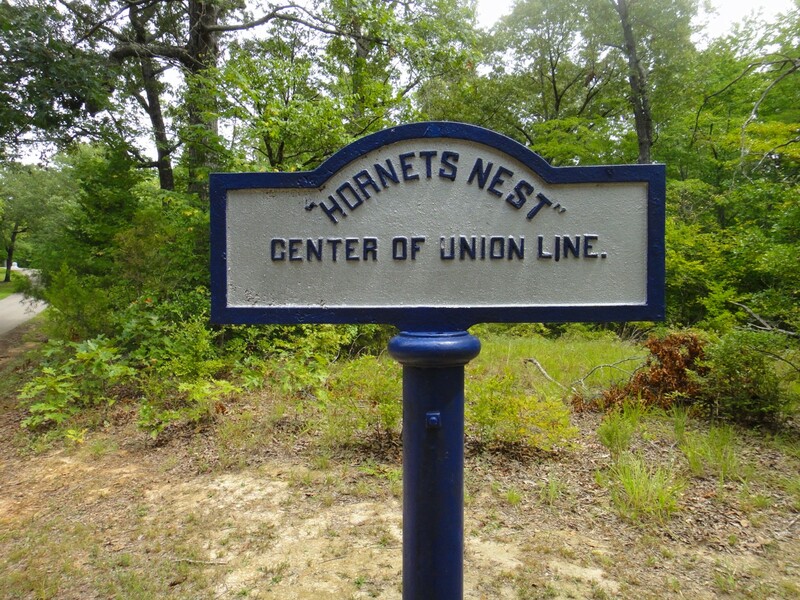 The Hornet’s Nest seemed such an anonymous spot. It is a good exercise of the imagination to visualize the Federal divisions that fought so desperately to hold their ground here. 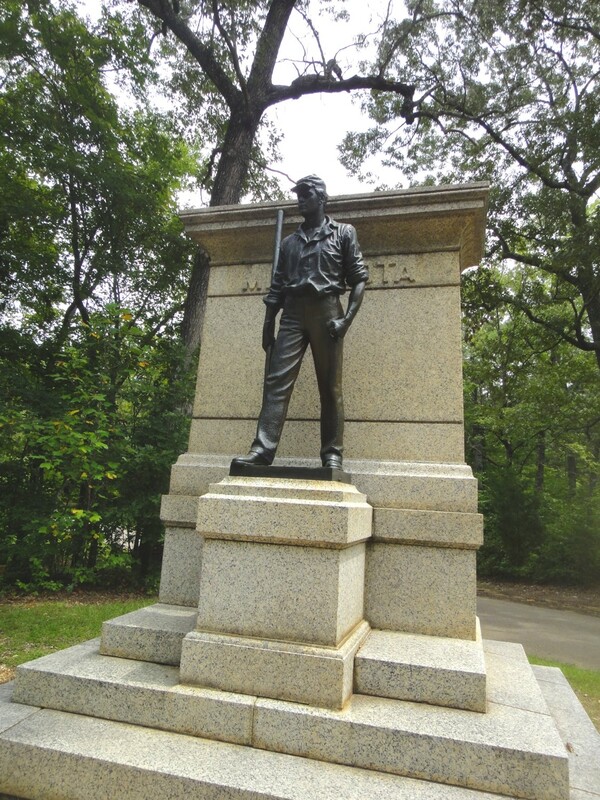 It was the Confederates who gave the spot its name. The Sunken Road was similarly nondescript. In the photo below, it appears as a line of relatively bare dirt. 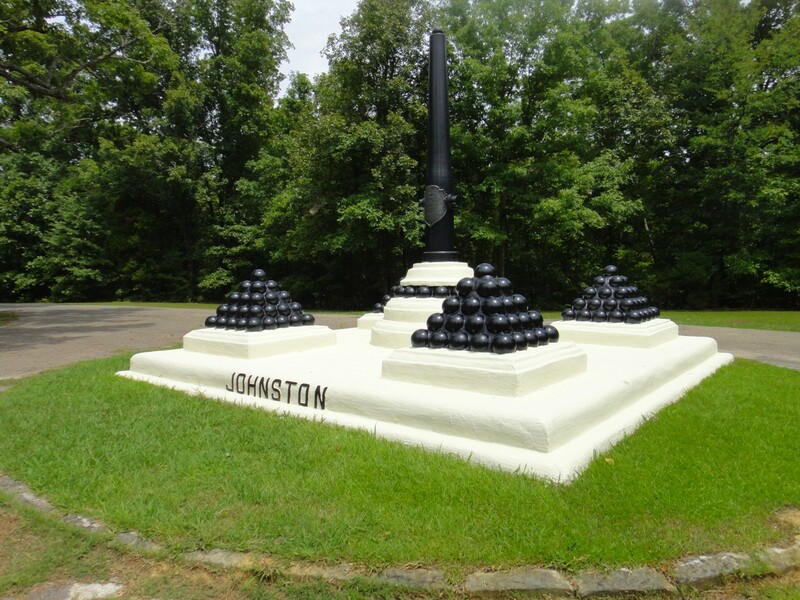 Each of the leading officers who was killed in the battle is memorialized by the same construction of four piles of cannonballs placed equidistant from a central column. 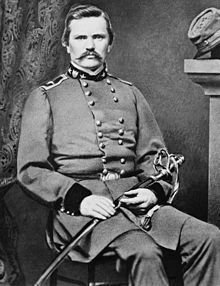 This one is for General Albert Sidney Johnston, the widely revered Confederate general who died at 2:30 in the afternoon on April 6. 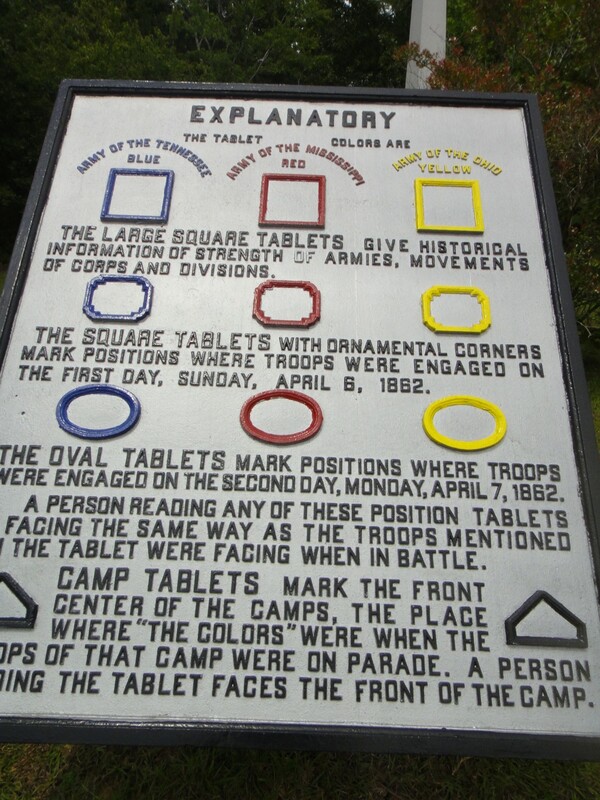 The nearby tablet explained the details of locating the exact site of his death. Isn’t it interesting how significant it seems to us to identify the spot rather than to say “He died somewhere in this vicinity”? 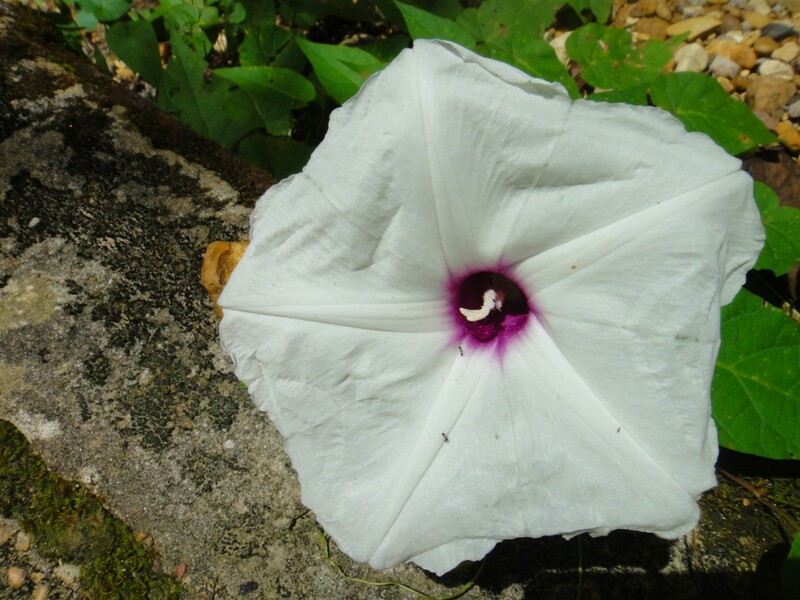 I found a single morning glory growing on the spot. I saw no others anywhere else on the battlefield. I visited another place that saw brutal fighting in the battle, now very peaceful. New peach trees have been planted on the site. 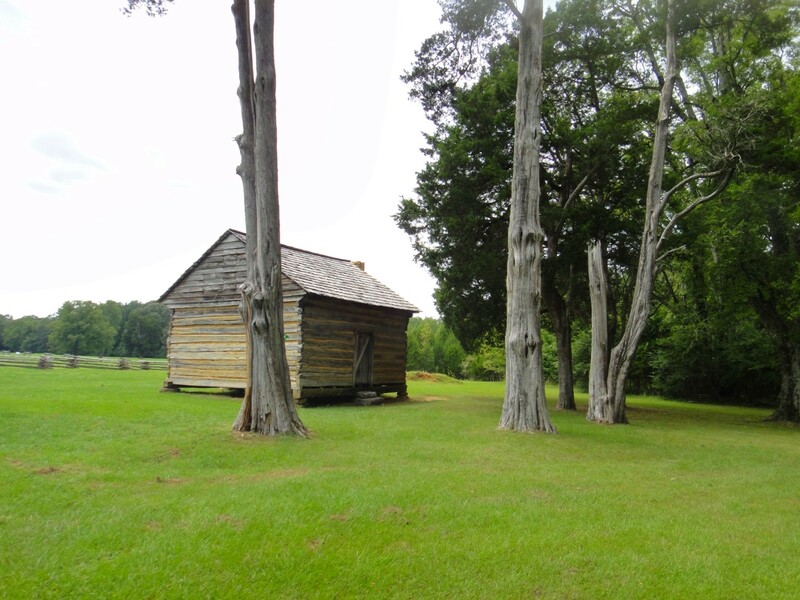 A cabin stands near the orchard, fronted by ancient, contorted cedars. Next stop was Bloody Pond, whose name hardly needs to be explained. 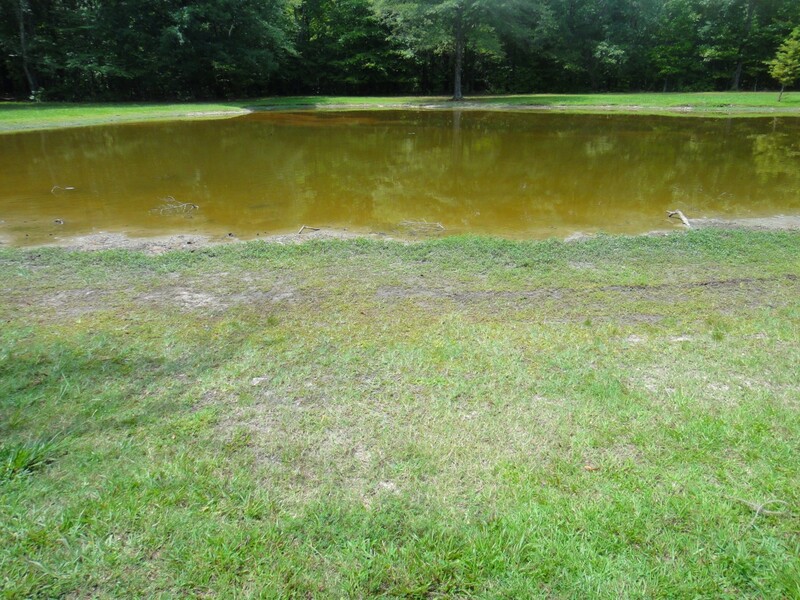 It is an unattractive pond, but of course it would have been exponentially uglier during the battle. 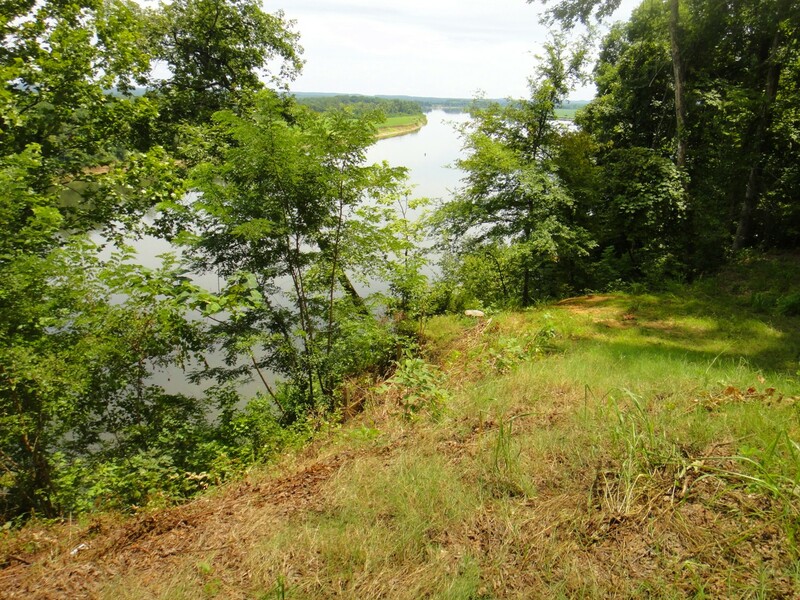 Because of the sequence I’d followed on my drive, I hadn’t seen the Tennessee River up to this point, even though the visitor center is close to it. 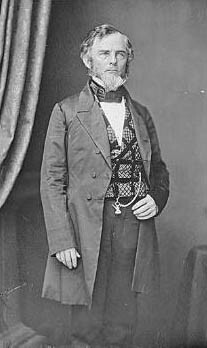 General Don Carlos Buell’s men arrived at the river on the night of April 6. 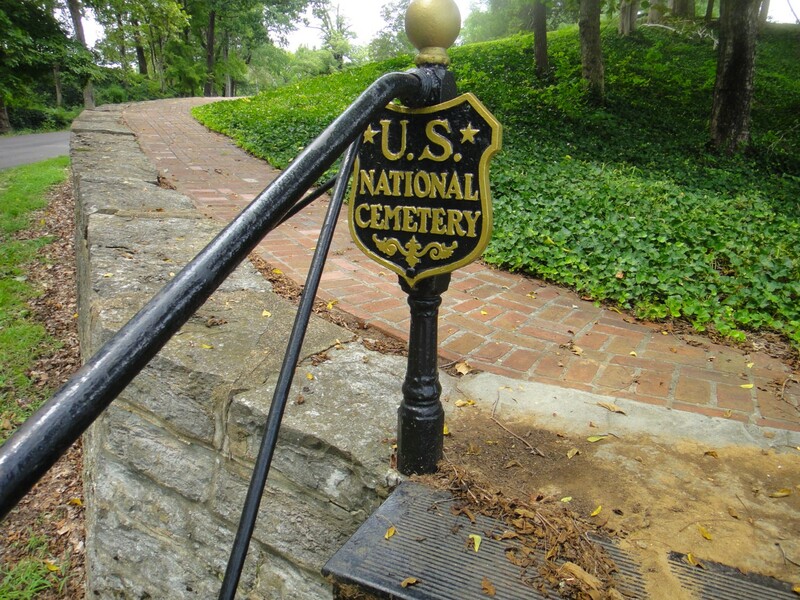 My final stop was at the National Cemetery, whose entrance was marked by an elegant sign. I saw that a group was at work in the cemetery, digging up headstones. 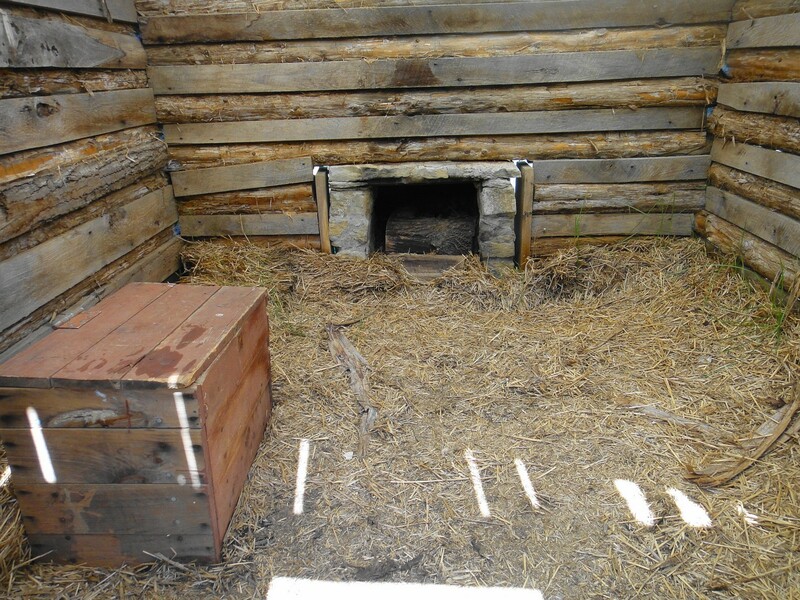 A ranger was supervising a group of young interns or volunteers. 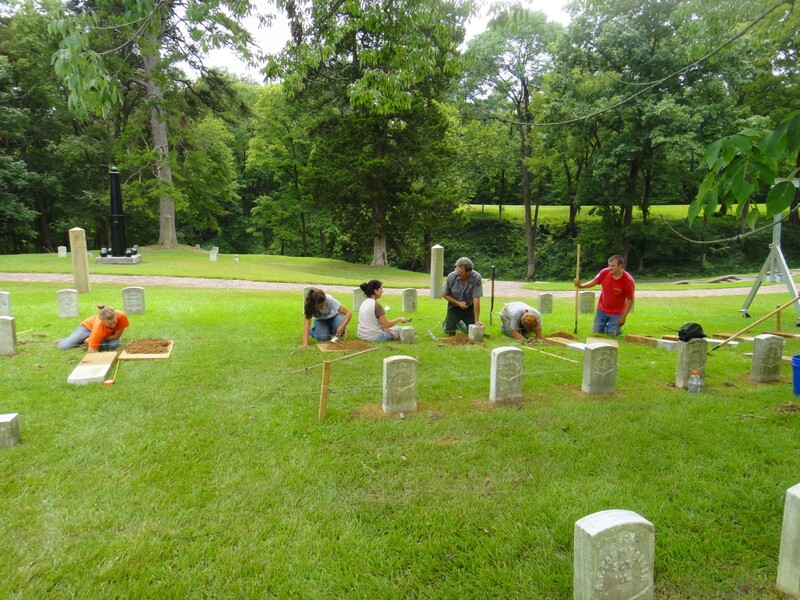 I asked them about their project, and the ranger explained that some of the headstones were starting to tilt, and they were lifting them out with a block and tackle to replace them in an upright position. I was pleased to hear that so much care was taken for these graves. 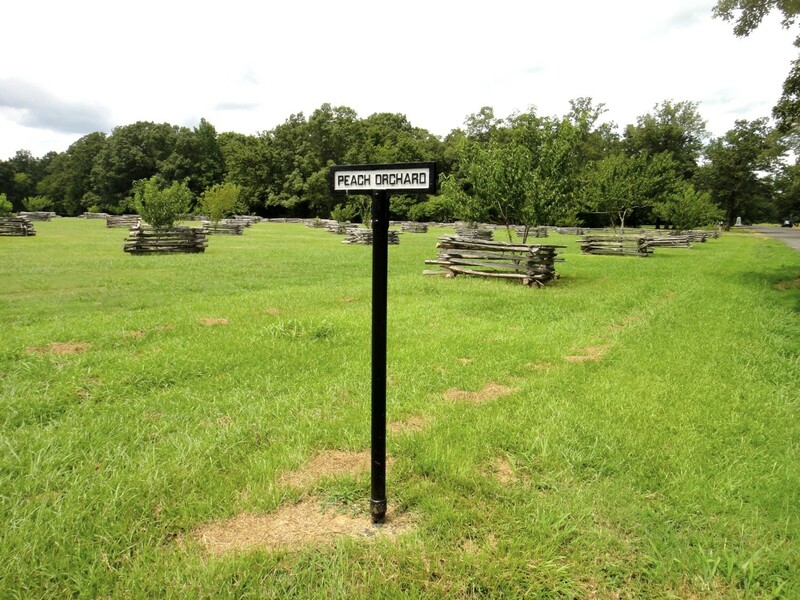 The soil, nearly pure clay, retained its sharp corners after the headstones were removed—but the ranger said the roots of the giant old ash tree behind them had been a big problem. 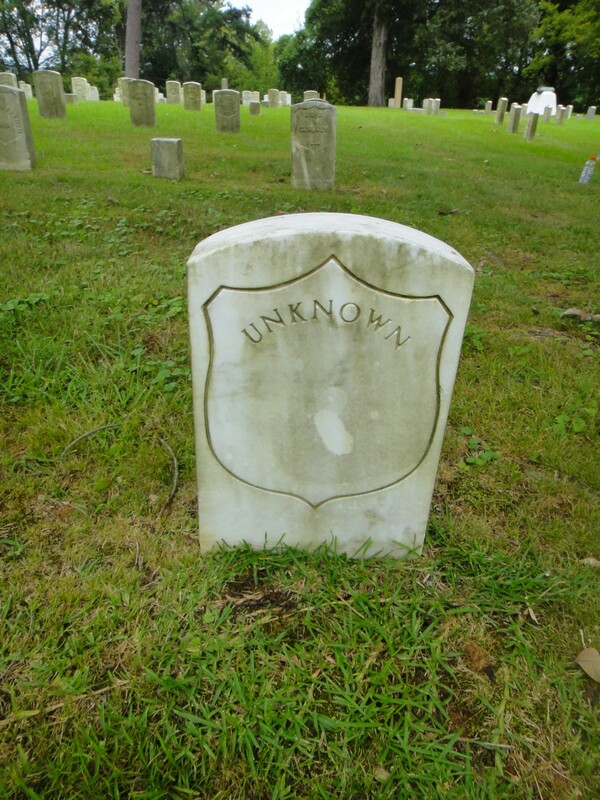 I said, “That ash must be really old.” he said, “None of the trees in the cemetery date to before 1909. A tornado that year destroyed every tree in the cemetery.” They timed their work to be under the shade of a tree in the afternoon, he said—the previous week, the heat index had been in the 120s. I marveled at how the portion of each headstone above ground consisted of only about half of the length of the stone. As I turned to go, one of the young women started singing a made-up song about how hard the work was. And so my visit concluded.